Posted at: 3/05/2011 12:35:00 PM . 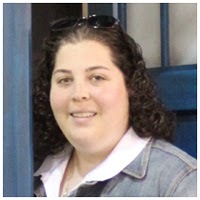 Recently I have thought about sites I mentioned months ago which might have gotten lost in the shuffle of things. I am going to begin reposting sites that I truly enjoy using when it comes to saving money. This repost is about eBates. Do you shop online? Why not earn money for every purchase. 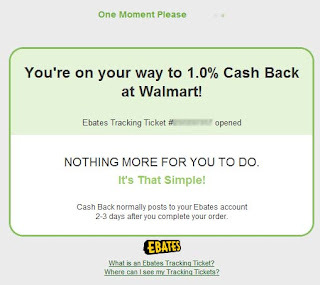 eBates offers cash back on everything you buy online. Plus, you'll get an extra $5 with your first purchase through them. Money is deposited in your Paypal account or mailed in the form of a check. You choose. Here are some of the most common questions with my best explanations of answers. If you have any additional questions, post a comment and I'll try to answer them. When you are shopping online, instead of going directly to the store's website you login to eBates and click the store through there. They have stores sorted by category or you can use the handy search feature if you know which specific store you want to shop at. Once you click the store's link you shop like you normally would directly from the store website. 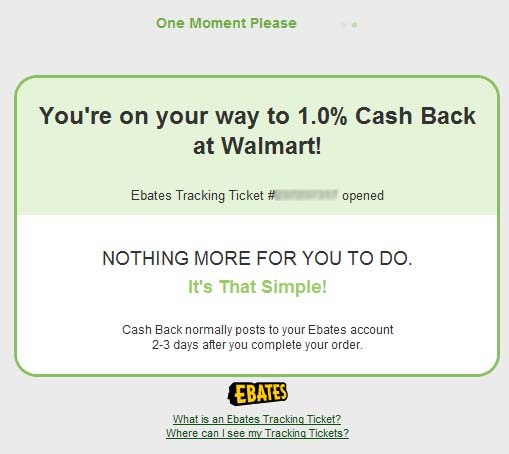 eBates tracks that you visited the store through their link and verifies a purchase with the store. Between eBates' site and the store's site opening, you will see a page that looks like this. Once it's verified you'll receive an email telling you the money has been added to your account. Each purchase must be made after clicking the eBates' link. If you click through eBates, go off to another website, and then return to make a purchase you will not be credited. When in doubt, go back to eBates and click the link again before checking out to make sure you are credited for the purchase. eBates makes payments by quarters: May, August, November, and February. To receive your payment eBates requires you to have a minimum of $5.01. Your money will continue to role over in the account until you reach that minimum and it doesn't expire. Once you've earned $5.01 there are three choices for your payment. They will mail you an actual check, deposit money in your Paypal account, or make a donation to the charity of your choice. Whichever payment method you choose, there are no fees involved. Also check out Shop at Home which runs a similar program but offers different payouts.